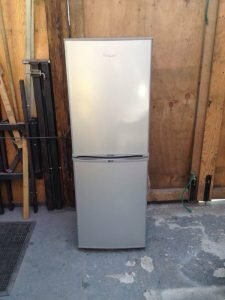 A tall standing Swan frost free fridge freezer. 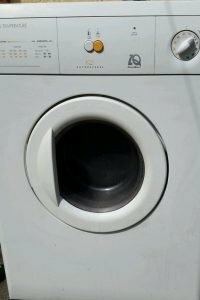 A white Zanussi large capacity under counter tumble dryer. 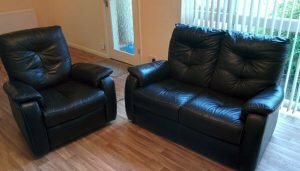 A two seater high back sofa and matching high back armchair, upholstered in black faux leather. 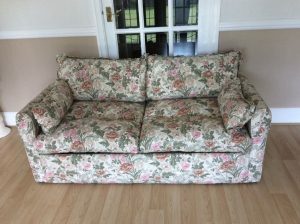 A two seater low back pull out vintage sofa bed, upholstered in heavily floral patterned fabric. 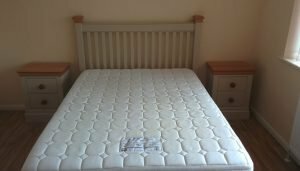 A double divan bed and memory foam mattress, together with a solid pine headboard and pair of bedside drawers. 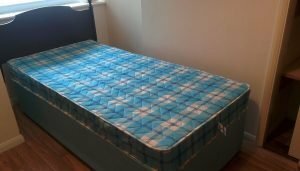 A blue single divan bed and mattress, together with a solid wood single headboard. 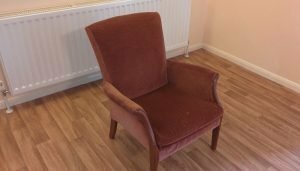 A vintage high back solid mahogany Parker Knoll armchair, upholstered in pale red velour. 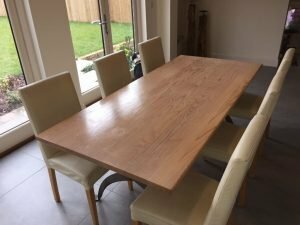 A large solid wood rectangular dining table, together with six high back dining chairs, upholstered in cream faux leather. 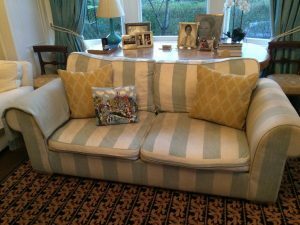 A two seater high back vintage sofa, upholstered in duck egg blue and white striped fabric. 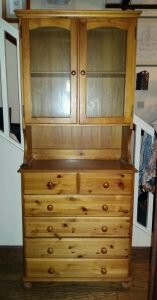 A tall standing solid pine dresser unit, having a glass door double cupboard above two small and four large drawers. 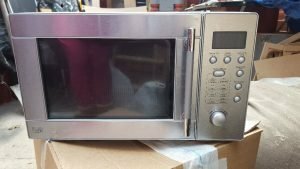 A stainless steel and glass counter top large capacity microwave. 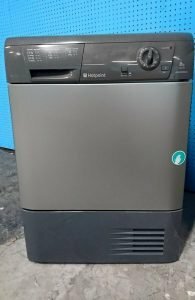 A space grey and silver Hotpoint under counter condenser dryer. 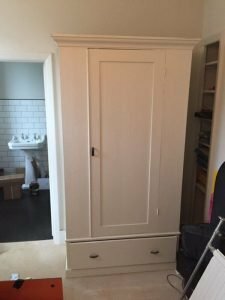 A hand painted white tall standing solid wood wardrobe, having a central door above a large drawer. 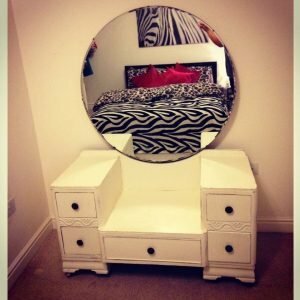 A hand painted white vintage solid wood vanity dresser with a large circular mirror, having two drawers to either side of a central drawer. 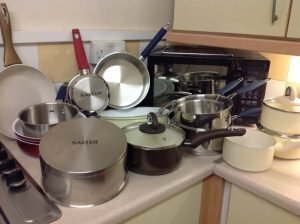 A large collection of kitchen accessories, to include a black microwave and a collection of red, cream and black Salter pans. 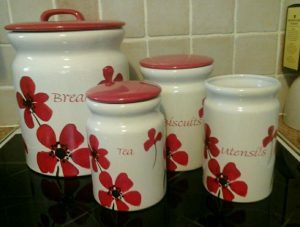 A collection of red and white floral patterned kitchen accessories, to include a large bread bin, a tea canister, a biscuit barrel and a utensil holder. 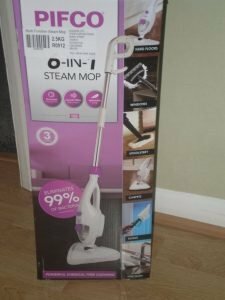 A brand new boxed purple and white upright Pifco 6 in 1 steam mop. 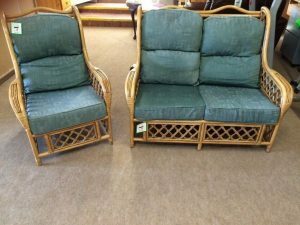 A two seater high back cane conservatory sofa and matching armchair, upholstered in patterned blue fabric. 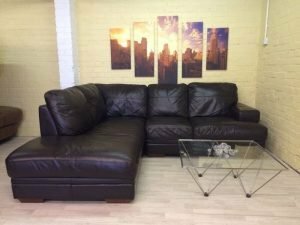 A four seater left hand high back corner sofa on solid wood feet, upholstered in black faux leather. 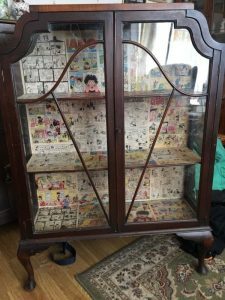 A solid mahogany vintage display cabinet, having glass inlaid doors opening to reveal two shelves, decoupaged to the back in Beano printed paper.